Bumble Bees play a vital role in the early fruit garden with apples, pears cherries and raspberries relying on these creatures for pollination. However, our humble Bumble is at great risk and we must act now if we are to have our apple pie. A few of the species have already become extinct in the UK with others on the endangered list. Intensive farming and pesticides over the years have reduced the wild flower habitat needed by these gentle creatures and whilst efforts are now being made to rectify this, we can also do our bit in the garden. Bumble Bees prefer native plants and those high in nectar and pollen. Our modern bedding plants such as Buzzy Lizzies and Begonias cannot provide this, so we need to think about other plants which provide nectar and pollen form early spring through to late summer. 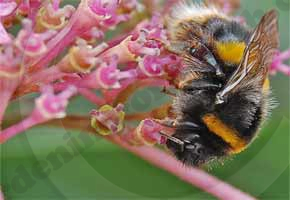 The Bumble Bee Conservation Trust has a list of preferred garden plants which all gardeners can grow to ensure these bees have a steady food supply. In spring, bluebells, heather and fruit blossoms provide an early feast, moving on through the summer to Lavender, Buddleia, Foxglove, Salvias, Honeysuckle and Scabious among others. You can also build or purchase Bumble Bee Homes to place in your garden. The bees only travel about 1.5Km from their nest, so is it important that they are as close to their food source as possible. Join the BBCT Bumble Bee nest box trial. Rhodent control is important too. Field Mice can decimate a Bumble Bee nest overnight, so either get yourself a cat or a supply of mouse traps.